What are the monasteries in Ireland you really should not miss? Of these ecclesiastical buildings there are quite a few, many of them in ruins, but to the discerning tourist, the choice seems to be overwhelming. So which Irish monasteries should one actually visit when traveling through the Emerald Isle? You'll stumble across many, in fact too many to even be all properly signposted. Because when Saint Patrick introduced Christianity to the Irish, he often founded a monastery to keep the flame alive. And from 432 A.D. to the dissolution of the monasteries under Henry VIII, monasticism flourished in Ireland. First in a specific "Celtic" way, later spearheaded by the European orders. 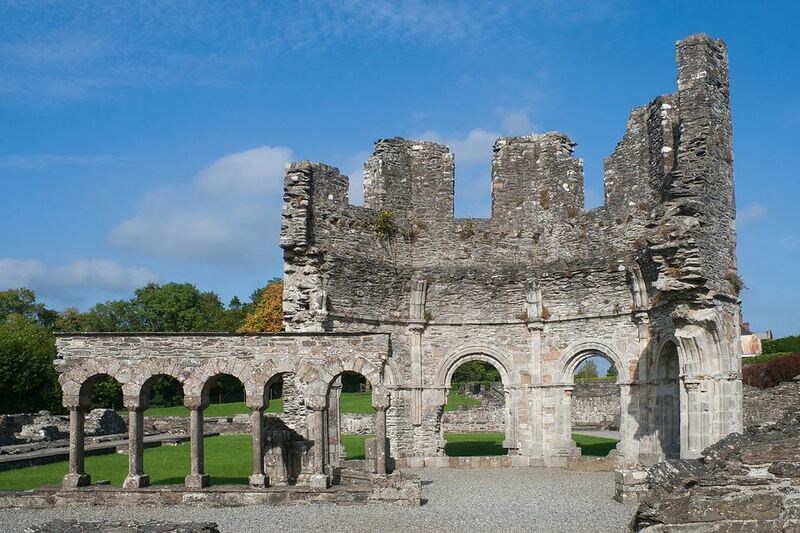 Ruins and remains of monasteries are still numerous in Ireland - and you really should include a few in your plans. This must be the Big Daddy, with both the stunning landscape and the sprawling "monastic town" being easily (in terms of distance at least) accessible from Dublin. Here Saint Kevin sought inspiration and peace, his adherents later founded a monastery at the spot near the two lakes. The solitude in the Wicklow mountains must certainly have appealed to the monks turning away from "worldly life". Even today the way there is not the easiest. And though the monks have long left, Glendalough's impressive remains (including a cathedral and a complete round tower) tell of past glory. This was a "lost" monastery and its location on a remote island in Strangford Lough in County Down makes it all the better for it. Though its round tower is but a stump and other remains are sparse, the small visitor center tells the interesting story of this settlement. And on a good day, the view from Nendrum across the lough is simply stunning. Be prepared for a bit of a curvy drive, though. Though the modern town has encroached upon it, the monastic district formerly found at Kells is still identifiable by the road layout. Which does not endear the historic town of Kells in County Meath to the motorist. The round tower in a corner of the churchyard contrasts with the later, partial medieval church spire. And a number of high crosses can also be found - one in an interesting incomplete state. Just a short distance from Monasterboice (see below), Mellifont Abbey in County Louth heralded the advent of "Continental" monasticism in Ireland. The buildings were laid out to exacting plans and most can still be traced today. Though Mellifont consists largely of ruins, the splendid lavabo bears ample witness to its past glories. You might be mistaken at first - from a distance Fore Abbey in County Westmeath has a certain "castle" feeling about it. Not without reason, as this was a fortified monastery built to withstand the odd unfriendly visitation by less pious contemporaries. Even in its ruined state it still conveys a sense of power and security. The best views can be caught from the raised dovecote. Another monastery resembling a fortress at first glance, Bective Abbey in County Meath seems to guard the Boyne crossing nearby, and you can actually visit it when doing the splendid ​Boyne Valley Drive. Many parts of the building are still fairly intact, though the cellars are not readily accessible. A place to explore and parking facilities have greatly improved in recent years, as has (free) access. This is one of the hidden attractions of Dublin - literally, as the chapterhouse of once mighty St. Mary's Abbey (which gave Abbey Street its name) is underground today. And incorporated into later buildings. Seldom visited by tourists it is a rare treat. Though the building itself is simple, its history is fascinating. And it'll give you a Dublin memory not many other visitors share. But check for the very limited opening times before trekking here! You will be hard-pressed to find the monastery here, Monasterboice has changed too much in the last few centuries for immediate identification of what used to be the "monastic district". But a sizeable round tower remains. As do some splendid high crosses that are amongst the best in Ireland. If you are looking for medieval stone carvings, Jerpoint Abbey in County Kilkenny is the place to go - the building is in reasonably good shape (for a ruin) and the columns surrounding the inner courtyard still bear witness to the stonemason's art. As far as "remote" goes, no monastery would be more remote than that found on Skellig Michael off County Kerry, a rocky outcrop off the Irish Atlantic coast. Here monks lived in prayer, contemplation and (one suspects) wet and cold conditions to test the patience and endurance of saints. With the waves making impossible to hear oneself thinking at times. Be prepared for a rough boat ride and steep steps. And if those ancient beehive huts form a long time ago remind you of a galaxy far, far away; yes, parts of the Star Wars saga were actually filmed here. Luke Skywalker chose this island as his hideaway, to get away from it all.